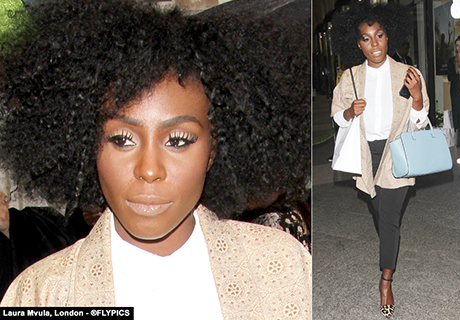 Laura Mvula looked a picture of health as she arrived at the Marc Jacob fragrance launch in fashionable Covent Garden, London. With credentials spanning as long as your arm Laura rocked up to the Marc Jacobs Fragrances: Tweet Shop – launch party wearing animal print shoes, black trousers, leather bag and fawn coloured jacket. The star who’s been working several different looks recently certainly feels at ease with her large curls. Also dressed to impress was TV star Made in Chelsea’s Lucy Watson who was sporting short blue designer dress. Lucy has recently returned from filming the hit TV show in the US. and looked super tanned for the fragrance launch. Other guests included presenter and Made in Chelsea TV star Ashley James who wore a cute floral dress, brown shoes and navy blue polar neck jumper to the launch. Singer songwriter Vanya Taylor from All About She was also welcomed at the Marc Jacobs party in London wearing a loose jacket, short yellow top, jeans and turquoise shoes . Acclaimed classically trained recording artist Laura Mvula will be performing at the Royal Albert Hall in Kensington soon. According to sources the Prom includes the public premiere of Jules Buckley’s new orchestral remix of Mvula’s album Sing to the Moon, in which the Netherlands-based Metropole Orchestra makes its Proms debut. Laura has rocked a number of different styles but appears to have found a look that she is comfortable with (top).